London’s EGX Rezzed conference offers visitors the opportunity to see the latest and greatest in upcoming indie projects. One such title on display this year was The Sinking City, by Frogwares Studio, giving me the chance to check out the upcoming open world detective thriller first-hand. The game takes place in a Lovecraft-inspired version of 19th century New England, with players controlling a private detective trying to solve the various mysteries that plague this tentacle-infested world. Right away I was impressed by how spot-on the Lovecraftian themes are, and the attention to detail shows in every corner, from the inexplicably flooded streets, to the NPCs, to the props in every scene. Frogwares did not miss a thing, and it absolutely shows. Gameplay is very interesting, as it branches out in different ways. Fans of Frogwares’ past titles (most recently Sherlock Holmes: The Devil’s Daughter) will be quite familiar with the most basic aspects here, though this is no traditional adventure by any means, feeling much more like the popular L.A. Noire in certain ways. Your job requires traversing all over the city, interrogating various suspects to discover clues for your newest case. Instead of a car though, you travel via motorboat through the city streets. Just watch out for the occasional tentacle or two. The occasional gun fight will surprise you both in its difficulty and abrupt appearance. You literally do not see it – or rather the scarily accurate Lovecraftian creatures you must fight – coming. In fact, I know of one reviewer who dropped her controller and made a sound not all that dissimilar to Daffy Duck yelping at the onset of one such gun battle. This not being me, no way, I’m super-tough, not afraid of nothing, no sir, nuh uh. I promptly laughed and continued my demo. The challenge here involves aggressive monsters coming at you at startling speed, attempting to end you using their various claws via brute strength. You must be quick to shoot them, lest they kill you in a most horrifying and gut-squelching manner. Should you die, the game restarts at the last automatic save point, so at least the stakes aren’t as cutthroat as the plot itself. An Xbox controller was used for the demo to navigate the protagonist in third-person. I found the controls themselves to feel quite fluid and intuitive, though jumping around a bit in actual gameplay (from shooting to driving a boat, etc. ), does take some getting used to. However, this is not unlike any other game that utilises comparable mechanics. In another similar fashion to both Sherlock and L.A. Noire, you use your trusty notebook to keep track of your cases. Current objectives, suspects and places of interest are all recorded in this handy-dandy book, and it serves as your most invaluable tool. Almost as helpful is your user-friendly map, which serves as a teleportation tool that allows you to quick-travel to specific locations around the city. 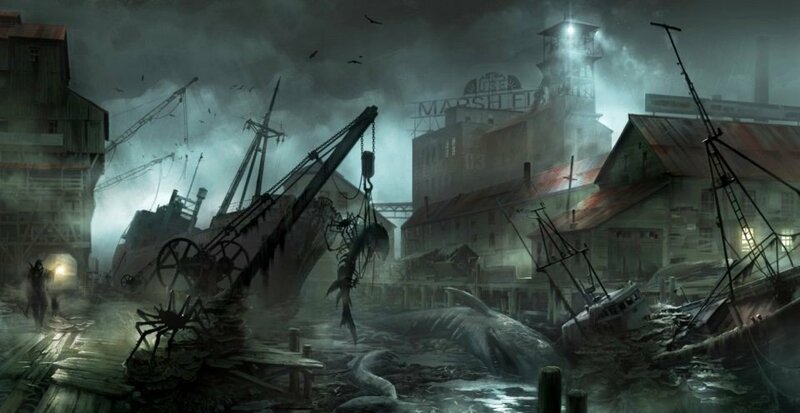 The Sinking City also features decision-making as one of its more prominent elements. The characters you talk to and the locations you visit are all dependent on how thorough you choose to be. The characters I met were extremely well crafted. One woman I spoke to had her mouth sewn shut, another nod to Lovecraft. When talking to someone, you have several options in your responses and the questions you can ask. At the beginning of this particular mission, I had the option of either charging or not charging my client a fee (in this case her wedding ring). Not wanting to deprive a distraught woman of her only memento of her missing husband, I chose to not charge her. Who says you can’t be altruistic in a game? Choices like these are what lead to other locations and characters becoming available to you. As all decisions are permanent, however, be careful what you say. In the case of my own playthrough, my intended good deed led to a very unhappy cult group getting their hands on me in the end. Though I didn’t see it for myself, Frogwares’ Sergey Oganesyan told me that these decisions also lead to a variety of different endings. With wide-ranging narrative branches even in small matters like this, playing the game the same way twice would be extremely difficult, as the number of choices you make are so frequent and varied it would be like trying to re-enact a Lovecraftian version of Groundhog Day. The environment is simply stunning, with every little touch adding to the wonderfully bleak atmosphere. Walking the city streets reveals giant monolithic structures in the distance (a mystery you will surely uncover later on), water-clogged roads that can't be traversed on foot, and a variety of characters that all seem like they maybe need a hug and a sandwich. The scum and grime is so plentiful, it’s hard not to check your shoes for something you may have stepped in. The fish market in particular is a cacophony of rotting fish guts, hanging carcasses, and workers afflicted with some sort of barnacle-like skin condition. I suspect that dermatologists aren’t covered in their health plan. Character animations are also very nicely done, both for the background NPCs and the people you interview. The diversity in character design allows for subtlety to shine through, adding even more to the immersive quality of the game. Overall, really the graphics are so strong that I genuinely hesitate to call this an “indie” game, just because the production value is so high. The soundtrack as well is a nice blend of classical and neo-noir, seamlessly fitting into the rest of the landscape. 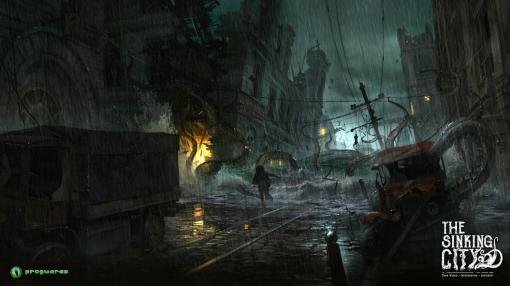 There may be those disappointed to see that Frogwares has embraced a more action-oriented direction after so many beloved Sherlock Holmes mysteries, but from what I saw the diverse mechanics are handled well, and it’s plainly evident that the Ukrainian developer is relishing the chance to bring a Lovecraftian city to life. Having now sampled the game personally, I cannot wait for the release of The Sinking City, as I am itching to uncover all the mysteries that lie within it. As a limited demo at a busy games convention can only reveal so much, we kept digging for additional insight into this upcoming Lovecraftian action-adventure. To learn more about the game, read on as Ingmar Böke chats with Sergey Oganesyan, community manager for Frogwares. I am so stoked for this game to come out! I can’t wait! This might be ‘THE’ game that brings adventure games to a complete new and higher level. It sounds like they are just at the start of production and reading what they want to achieve, it will take a long long time to complete. Late 2018 sounds very optimistic.